The town of Pownal isn’t really a town at all. 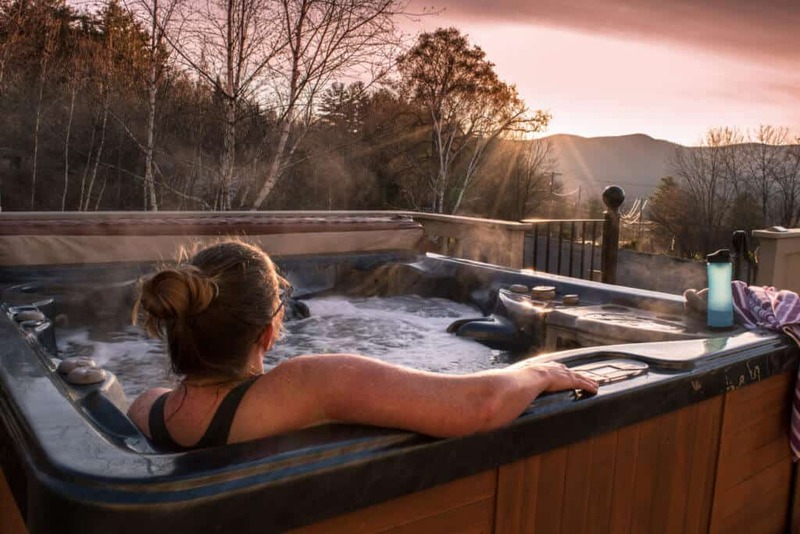 Nestled in the southwestern corner of Vermont, it’s a distinctly rural community, known for it’s beautiful Vermont landscapes and recreational opportunities. Because Pownal is located in the Green Mountain National Forest, and is surrounded by mountains, you’ll find plenty of opportunities for hiking, mountain biking, and cross-country skiing, but it’s also just a few minutes away from world-class art museums, excellent dining opportunities, and unique shopping experiences. 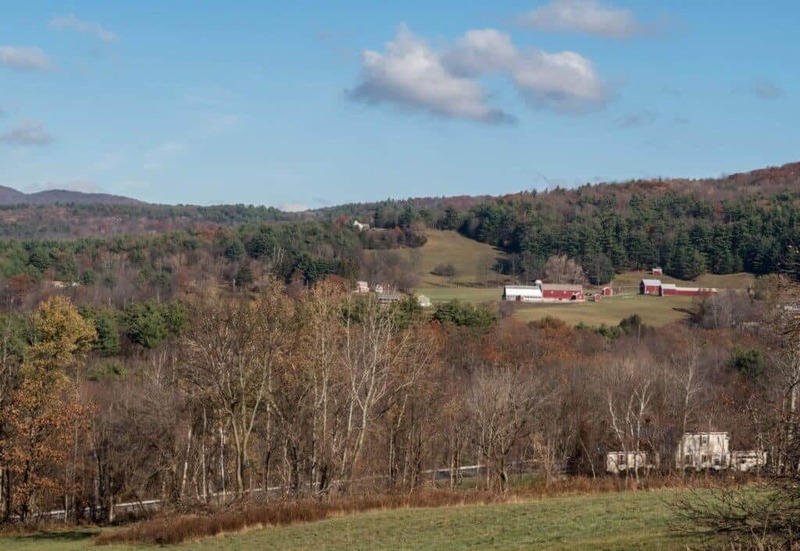 It’s proximity to nearby Bennington and Williamstown, Massachusetts, makes Pownal a near-perfect destination — It has all the benefits of rural living, without being in the middle of nowhere. 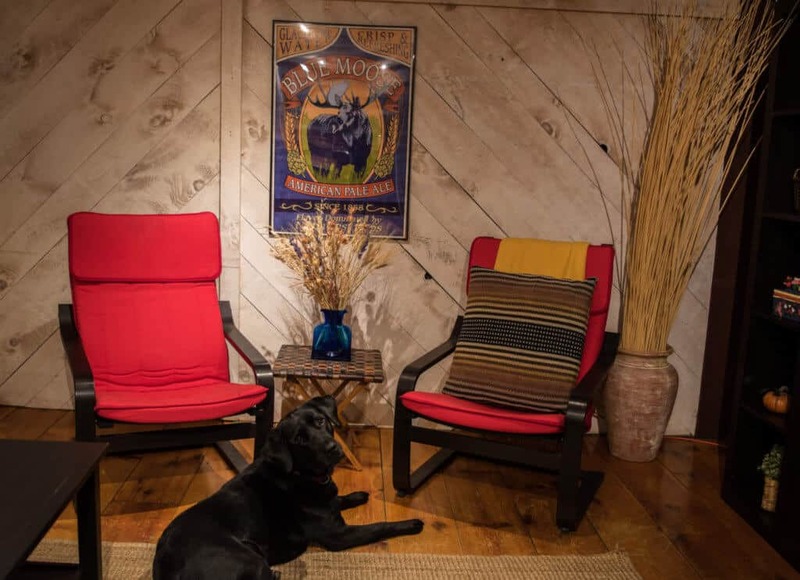 I was lucky enough to escape to the perfect southern Vermont vacation rental in Pownal for a mid-week retreat, courtesy of Glamping Hub. Because southern Vermont is my home, I’ll have to call this little getaway a staycation. I packed up my favorite traveling companion, Flynnie the Labrador, and headed into the hills on a Tuesday afternoon. What followed was two days of relaxing, eating home-cooked meals, hiking, and soaking in the outdoor hot tub. In short, a midweek vacation that will be pretty hard to beat. 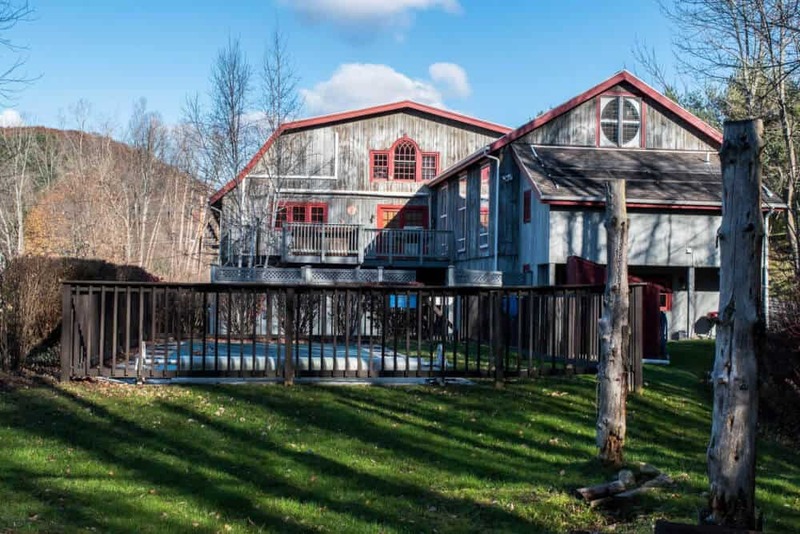 To make it totally perfect, I would have shared my Vermont vacation rental with a few friends. Next time! The vacation rental I chose for this particular adventure is actually a renovated dairy barn, and when I say renovated, I really mean it! From the outside, it kind of resembles a barn, with gray wood siding and gabled roof, but once you climb the spiral staircase and walk through the front door, it’s like being in another world entirely! 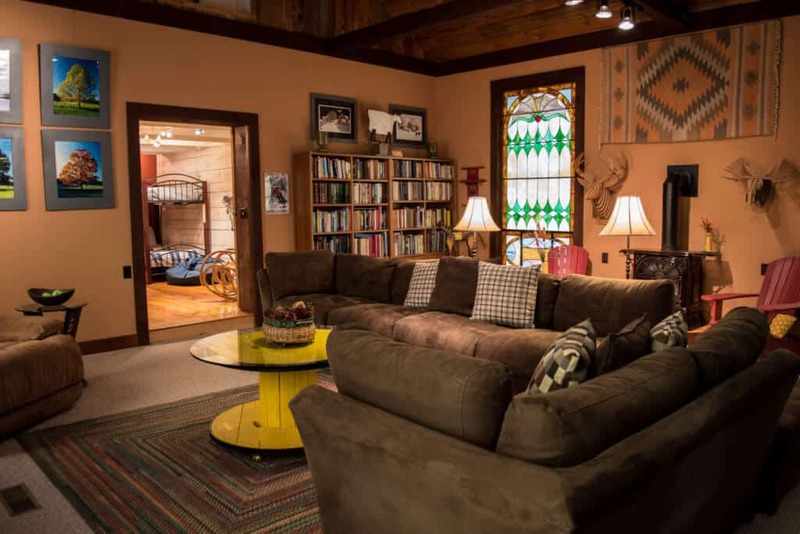 First of all, this place is huge — with a restaurant-worthy kitchen, a large dining area, a media room, separate library, and beds for six people, eight if count the pull-out couch. It’s not the size that makes it special, though. The interior has been so meticulously and thoughtfully renovated, taking what I imagine to be a wide-open space and outfitting it with the coziest and most delightful rooms you can imagine. The furnishings are an eclectic mix of ultra modern and rustic country, with so many lovely details, you could spend hours just wandering and taking it all in. Here’s a little tour to give you an idea of how magical this place is! When you walk into the main entrance, the dining room is right in front of you. There is seating for at least eight people, with plenty of light and warmth to go around. 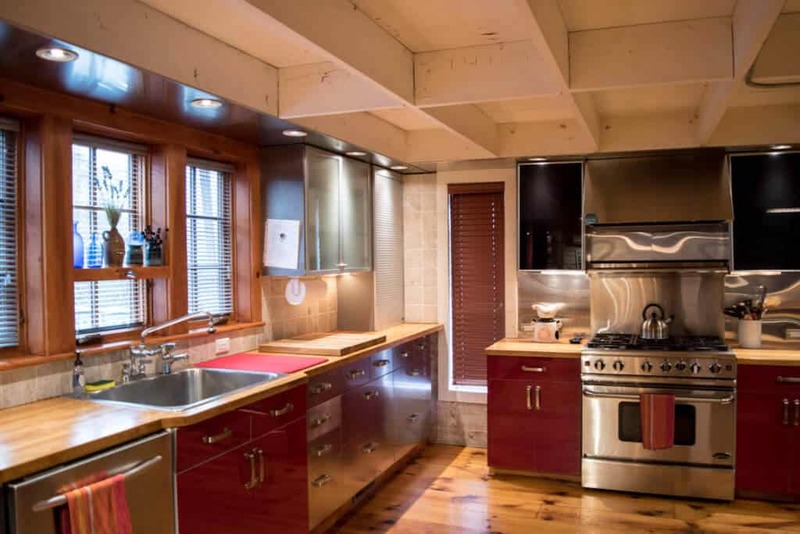 The kitchen is on the left, larger than any vacation-rental kitchen I’ve ever seen. 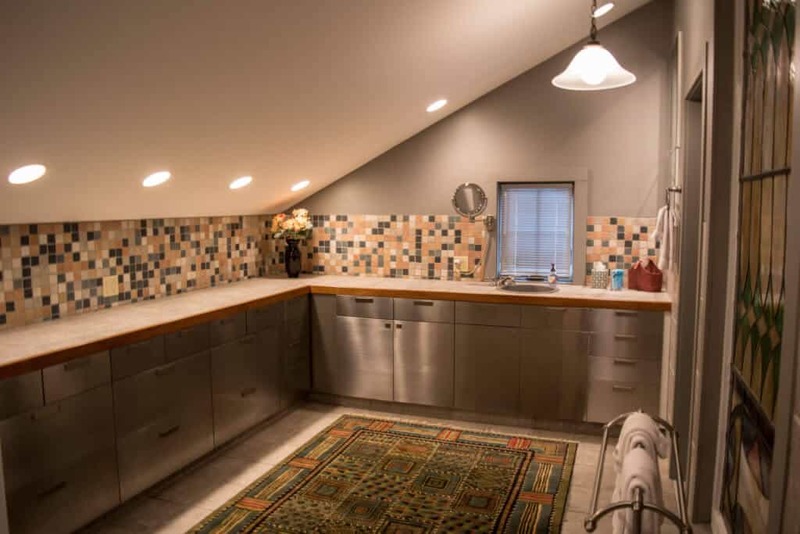 It’s got a full-size gas range and oven, a separate freezer and refrigerator, and a massive butcher-block counter for meal prep. Cooking giant family meals would not be a problem in this kitchen! In fact, spending two days cooking her for myself (and Flynn) felt like a bit of a waste. Next to the kitchen is the media room. This is also where the pull-out sofa is for extra guests. This is where you relax in front of a movie after that huge, gourmet meal. There’s a large, flat-screen TV, a DVD player, and seating for the whole family. Like all of the rooms, it’s super cozy and inviting. Flynn enjoyed the media room. He watched a documentary about wolves. To get to the other rooms, you have to turn around and walk back through the kitchen and dining room. The kids’ room is next, separated from the dining room with a temporary partition, but private enough. 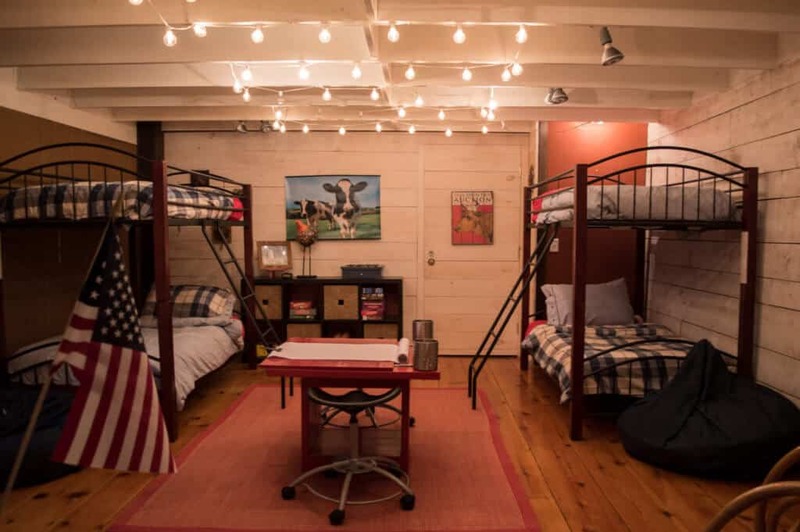 Two sets of bunk beds make this room perfect for up to four kids (or adults). 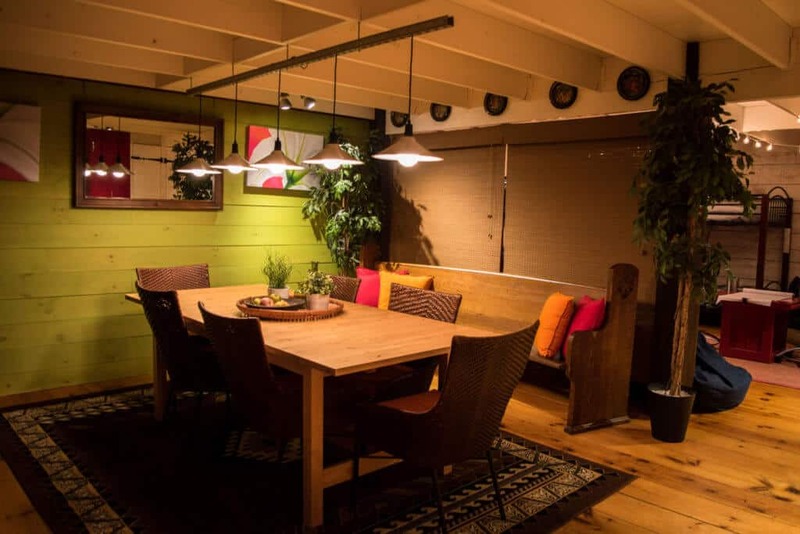 There are board games, twinkling lights, and bean-bag chairs to delight young guests. A kid-sized table in the middle of the room is set up for drawing, with crayons and paper ready to go. Flynn liked the kids’ room as well. He wished there were kids to play with. After exploring the kids’ room, hang a right through the open barn door into the library. The library, master bedroom, and bathroom are in a separate wing, and can be partitioned off from the rest of the house by closing the sliding door. This is where I spent most of my time. The library is exactly how I want my own library to be (someday) — there are walls and walls of books, comfy seating all around (the recliner was my favorite), and a gas-burning fireplace, which made Flynn feel right at home. 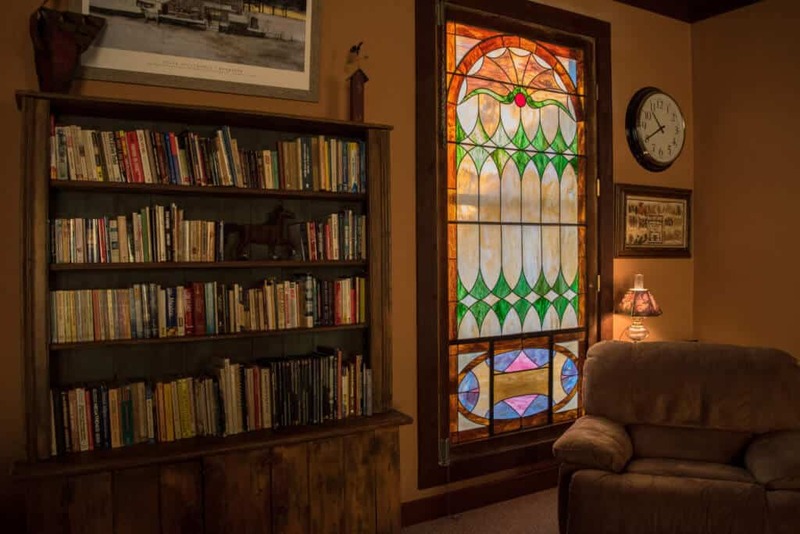 While the room is kind of dark, like a library should be, there’s lots of good lighting if you need it, and these massive stained glass windows make everything feel so old, warm, and inviting. Beyond the library is the master bedroom, which is actually part of the library, but partitioned off for privacy. There a super-comfy king bed and a little corner desk for writing. I found the room to be a little dark, but since all I did was sleep there, it was pretty much perfect. The bathroom is right off the master bedroom. 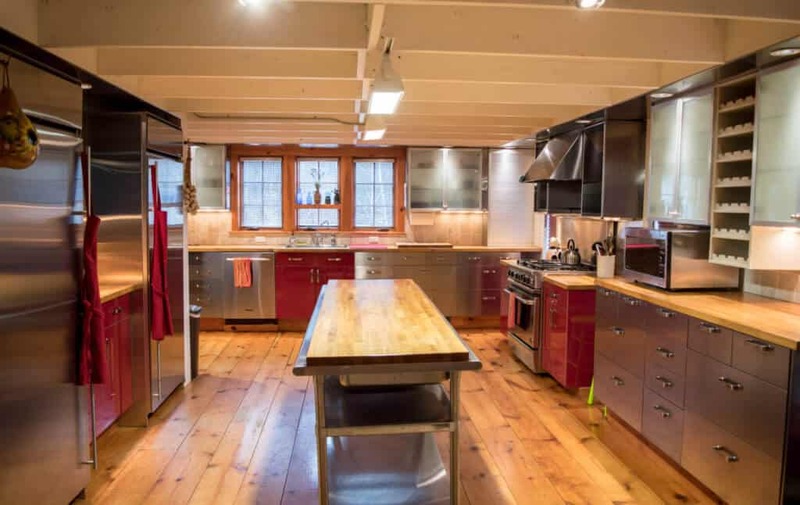 It’s huge — with lots of counter space, a washer/dryer, and a large walk-in shower. 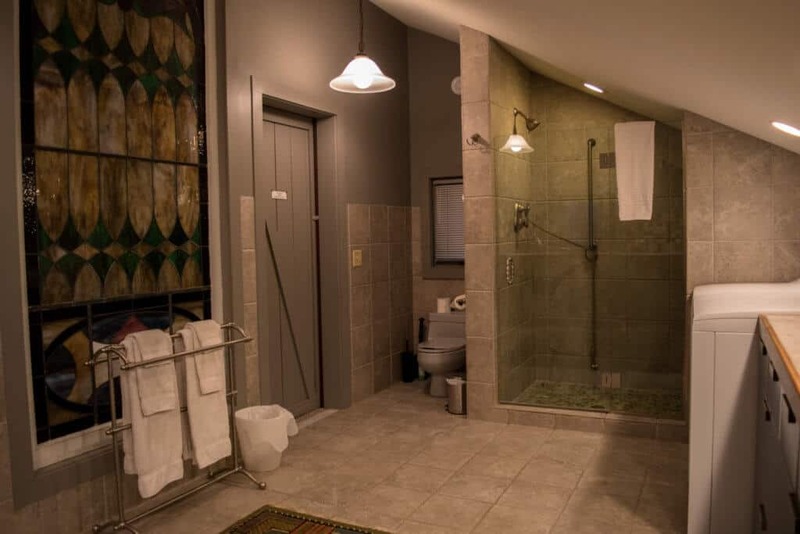 If a were vacationing with a house full of people, I probably wouldn’t love that the only bathroom was off the master bedroom, but it’s no big deal for a couple or family. The property is located right on route 7, which is a pretty busy road. Although you can hear the traffic, there is a wooden fence between the yard and the road, so you can’t actually see it. The backyard is spacious, with a nice lawn for playing on. There’s a fire pit for relaxing outdoors and a large swimming pool for summer fun. On the deck outside main entrance to the rental, you’ll find the hot tub. It’s got seating for four, powerful jets, and water that can be heated to 104℉. Soaking in the hot tub before dinner is a great way to pamper yourself, and even though it was cold outside, I didn’t notice. Flynn, on the other hand, would much rather relax inside by the fireplace than on the cold deck, but he didn’t hold it against me. 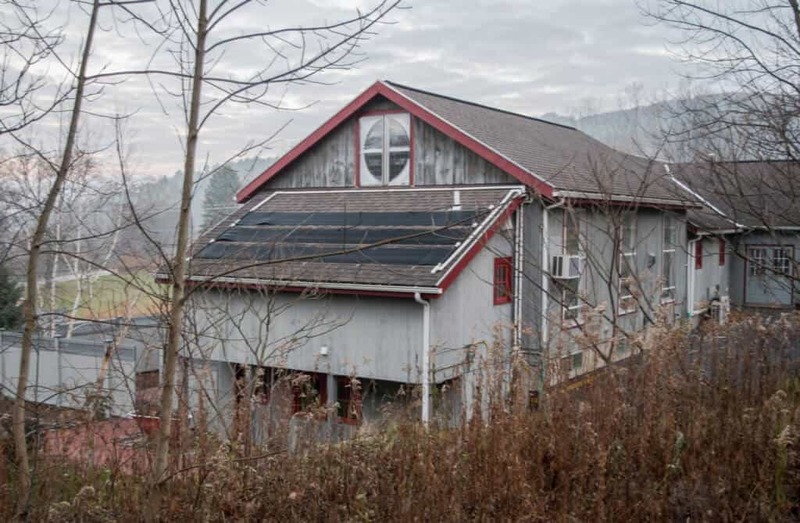 Pownal is located in the Green Mountain National Forest and the world-famous Appalachian Trail runs along a nearby ridge. 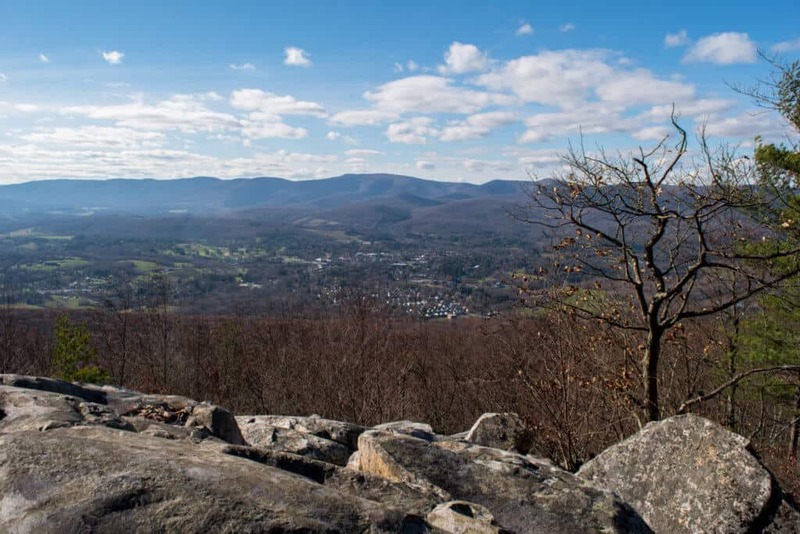 Both the Taconic and Green Mountains surround the town, providing lots of opportunities for hiking and mountain biking. Because we did our exploring during hunting season, we stuck to trails that we knew would be relatively safe. One of our favorite trails is the Pine Cobble trail in nearby Williamstown, just 10 minutes for our rental. 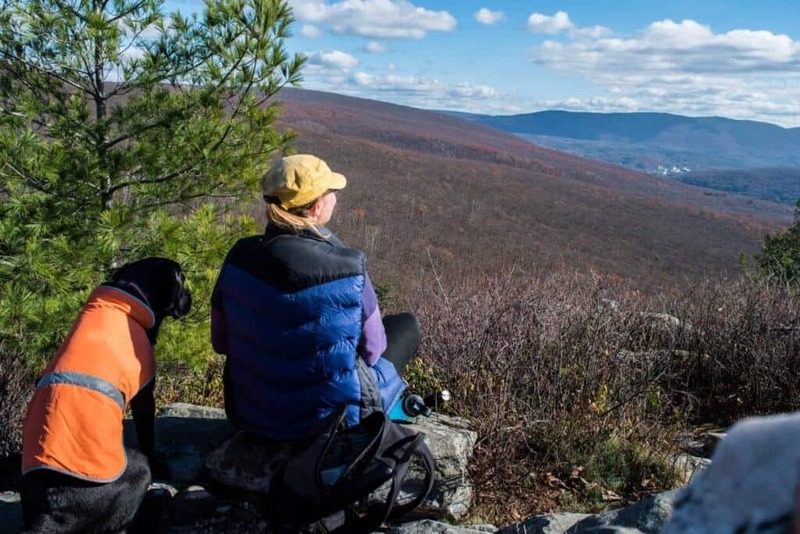 The trail is maintained by the Williamstown Rural Lands Foundation, and is 3.6 miles (out and back), with the potential for a longer excursion on the Appalachian Trail. It’s a moderately difficult trail, with a gentle, but steady climb to the top. The Pine Cobble summit provides spectacular views of Mt. Greylock, North Adams, and Williamstown. My only words of caution would be to watch for loose, jagged rocks in the trail, especially in the fall when they’re covered with leaves. Another natural area worth exploring is the South Stream Wildlife Management Area. This is a nice spot for bird watching, fishing, and paddling. There’s a short trail around one side of the pond, and lovely views of the surrounding mountains. While I don’t recommend exploring during hunting season (unless you’re hunting), it’s a great spot to visit all through the year. This property is located on South Stream Road, just a couple of miles from the rental. It’s dog friendly! We don’t always travel with our dog, but it’s a huge plus when it works out. 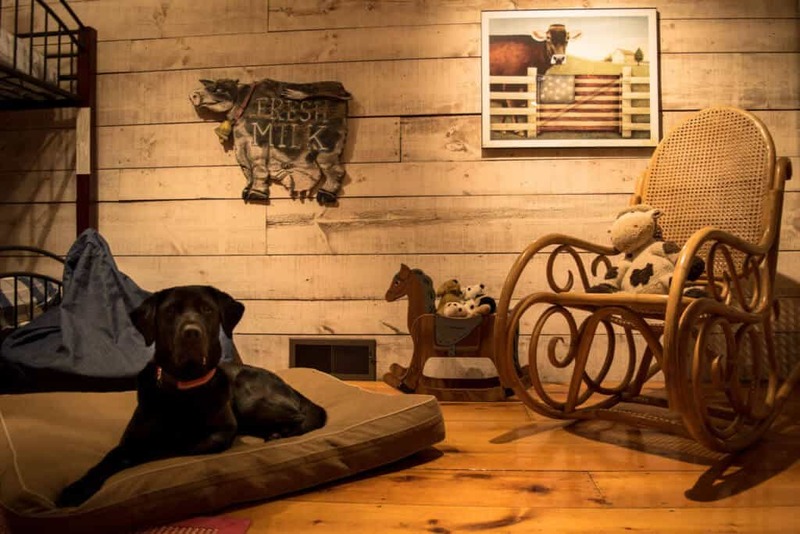 This property welcomes dogs. They just have to be approved beforehand. Soaking in the hot tub was so relaxing. I know I already said that. It’s a great deal. 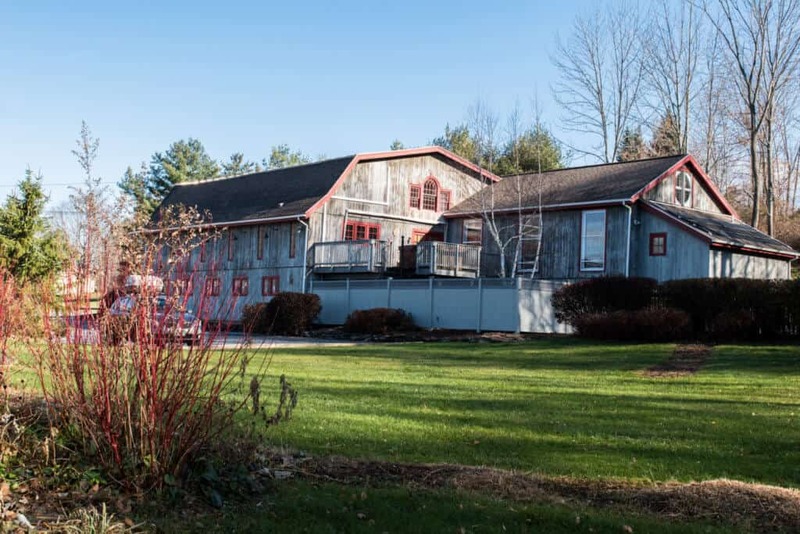 If you are searching for lodging in Bennington or Pownal, you will find lots of not-so-lovely motels, a Best Western, and a Hampton Inn. The two chain hotels are located in the strip-mall section of Bennington. 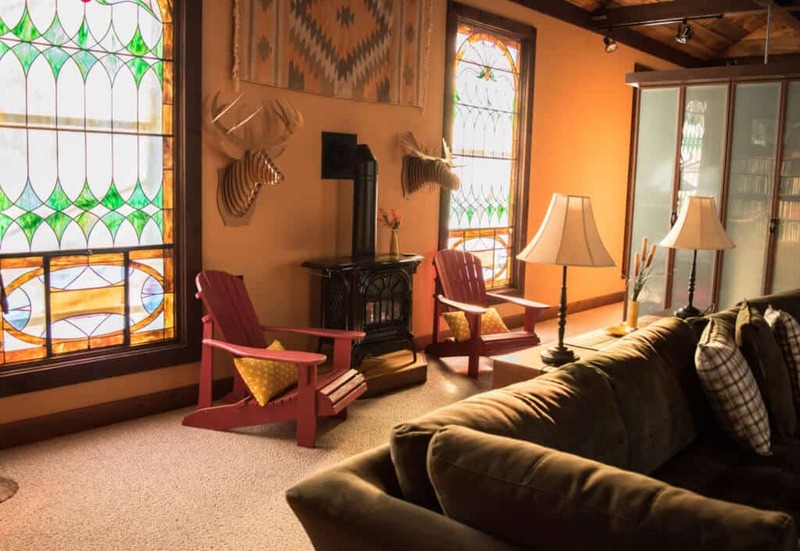 They sleep up to four people, and they are more expensive than this vacation rental. At $177 per night, this may not be a budget accommodation, but it is a great deal for what you get. The Gourmet Kitchen is awesome. The kitchen has all the equipment you need to cook up some serious grub. I love going out to eat (and if you need advice, leave a comment), but it was so awesome to stay in and cook for myself. The road is busy and noisy. This was not a huge deal. I loved that we could hop on route 7 and get to Bennington or Williamstown quickly, but if you want to be in the middle of nowhere, this isn’t the property for you. Also, the yard isn’t fenced in entirely, so I don’t recommend letting your pups off-leash or letting your small kids play without constant supervision. The spiral staircase that leads to the rental is steep and not well lit. I’m fine with navigating steep stairs, but throw in a senior dog (on a leash) and a suitcase, and it was a little tricky getting up and down. I used a flashlight, which was provided, to take Flynn out at night. I was longing for a radio. Silly, I know, but at home, I always cook to music. I would have loved a radio or docking station to play my tunes in the kitchen. All-in-all, I had a fabulous southern Vermont staycation. In fact, I better start planning a summer visit so I can take advantage of the swimming pool. You can find booking information for this property on Glamping Hub. 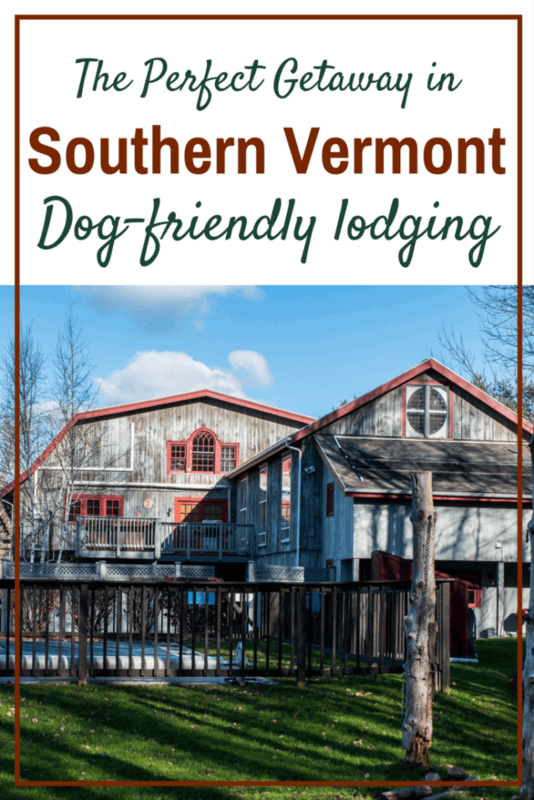 If you are looking for more Vermont vacation rentals, read our recommendations in this post. 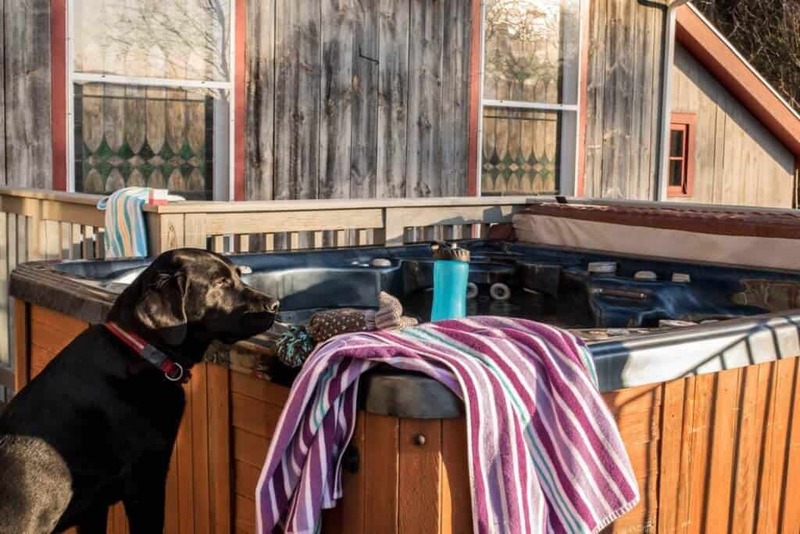 if you need a dog-friendly rental, be sure to visit Glamping with Pets. Please note: This post was sponsored by Glamping Hub, who provided us with a free vacation rental in exchange for this post. As always, I would never recommend a place or product that I don’t know and love. Thanks so much for supporting Back Road Ramblers. We’ve been close to this place last Fall and we absolutely loved the quiet and the forest. I’m noting down the info because you’ve been staying at a lovely place, we’ll keep it in mind for our next trip! You won’t be disappointed, Dany. Perfect spot for southern Vermont adventures. The library was my favorite spot until i reached the part where you showed me the bathtub. That is so perfect. I’m going a step further and imagining the view in autumn. Luscious! What a great price for that house! I love the kitchen and the setting is stunning. All rentals invariably have something that you don’t like about them, but you get on and make the most of it. Perhaps the owners will take the lack of lighting on the stairs onboard and do something about it. Wow, that’s a magnificent house! It reminds me of our lake house in North Dakota. I bet you were able to soak in the beauty of nature. It’s my kind of homey place, especially because it’s surrounded by mountains! Wow, what a GORGEOUS property! I love the modern kitchen and bathrooms. The kids room looks so cozy and so does the library. thanks for sharing! What a beautiful location, it really looks ideal for those who want to get out and explore the amazing landscape right on your doorstep. But also perfect for those who want to escape it all and relax! I love Vermont especially doing the changing of the colours of the leafs. This place looks like a beautiful place to stay, so homely and something I would consider when in the area. That little corner of Vermont looks great – especially that house. I always like staying in accommodation that that makes me feeling like I’m at “home” – this cute converted dairy barn certainly would offer that. Shame about the proximity to the road – peace and quite is always nice when you are away. What a very lovely looking place, really beautiful and spacious accommodation in a great location for the Green Mountain National Forest. Good to know about the steep staircase to access the property though — that might actually be a problem for me, especially in the dark, as I have both balance and mobility issues and terrible night vision! $177 for that house! Not bad at all. Seems so peaceful. Have to say I love the kitchen and I’d probably spend most of my time in the jacuzzi! I’ve recently been using Airbnb more, and I’m loving the comfort of having your own place. Still haven’t gotten a vacation rental though, but seems similar.